Daulat ki Chaat (Chandni Chowk, Delhi 6). 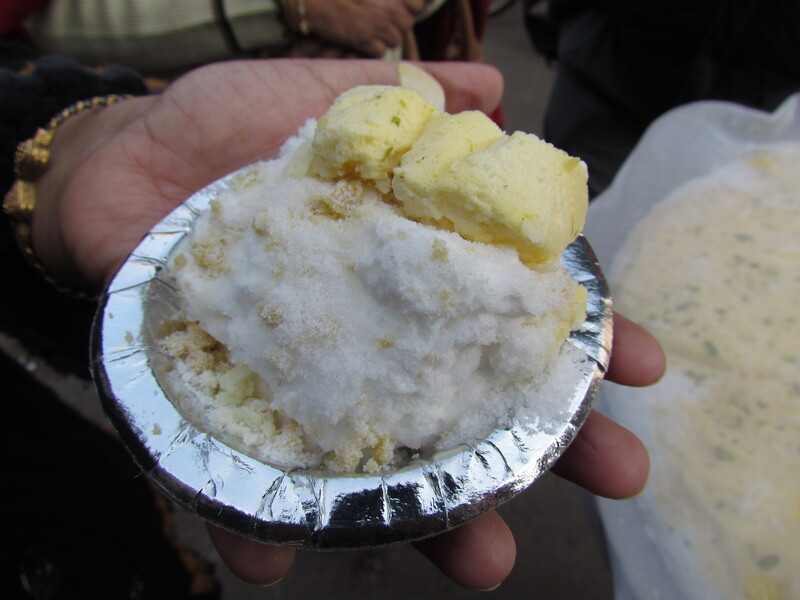 Totally unlike the mental image of ‘chaat’ that we have, this is a unique milk based dessert that is sold only in winters , on the streets of Chandni Chowk & not in the famous Sweet Shops. 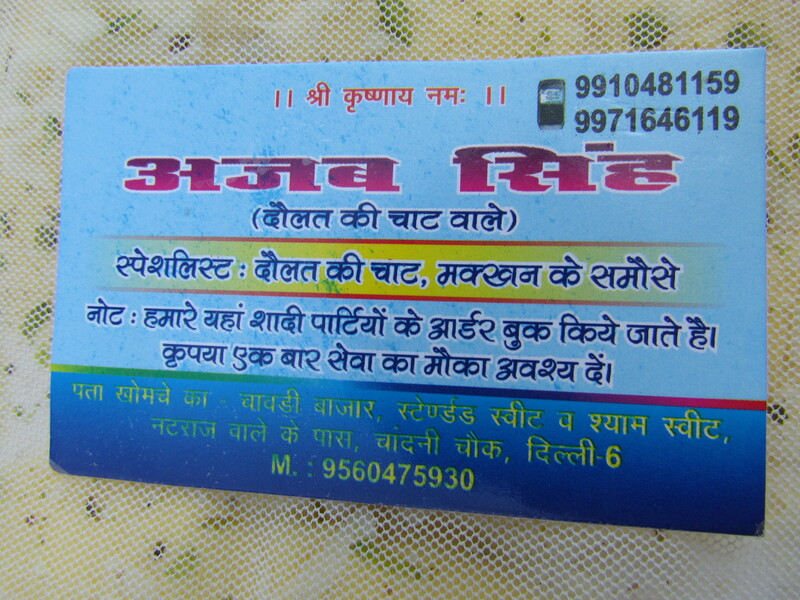 Address & other details: Walk from Red Fort to Fatehpuri Masjid – U will get many people selling these from carts / tripods. As mentioned above, our mental picture of chaat is something with salt, sweet & sour tastes & a variety of ingredients with different tastes & textures served together. 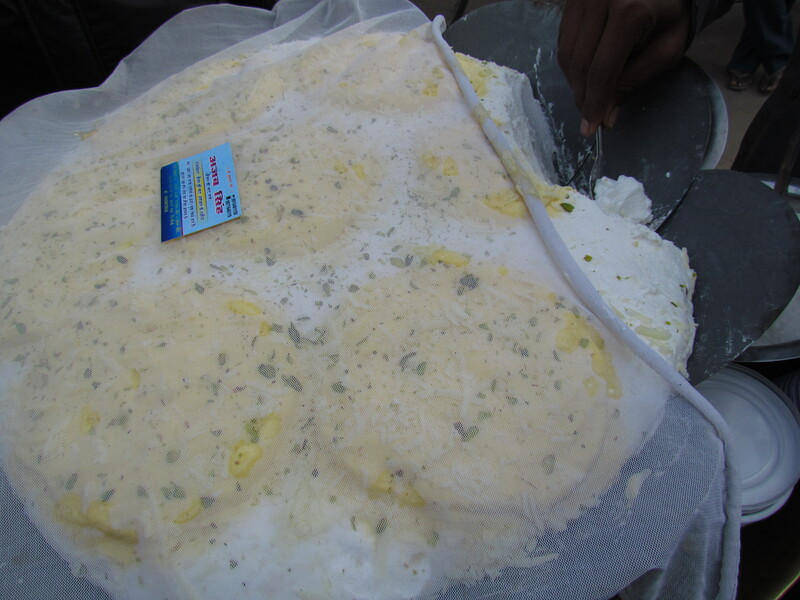 Daulat chaat does not have anything to do with salt or sour or chatpata chaat masala. It is a sweet fluffy dessert made from milk. Usually the seller of the chaat gets the base ingredient of the chaat in a large container. The base is already topped with pistachis as u can see in the pic. To save from flies & dust usually the food is covered with a fine see thru cloth. The base of the chaat is usually white in color with the top layer / parts of it yellow in color dueto addition of kesar / food color. 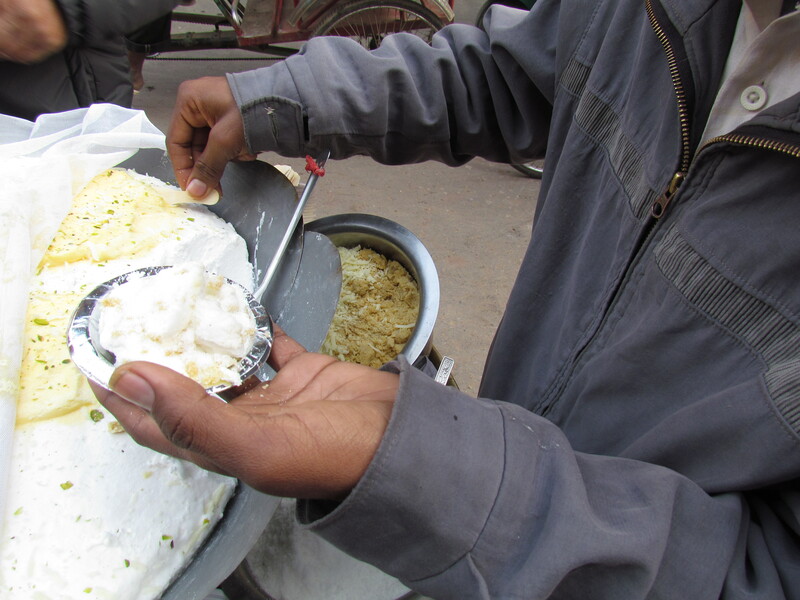 Once order is placed, the seller of the chaat picks up few scoops of the base & tops it with powdered sugar & Khoya (reduced milk). The base does not have any sweetness – hence the need for adding sugar. Some people serve just like that. Others mix these three things & serve. Some serve in disposable paper bowls. Others serve in Kulhars. The taste is quite unlike anything Indian. A soft fluffy creamish texture that lands on the tongue & vanishes soon, to ask for more. The Khoya adds to the taste & richness. Mixing in process – Bowl of Khoya & powdered Sugar peeps from the background. Since this is milk & cream, once winters r over, it cannot b sold in the Delhi Summer temperature as the thing wud just melt – That is the reason why u get this only in winters. 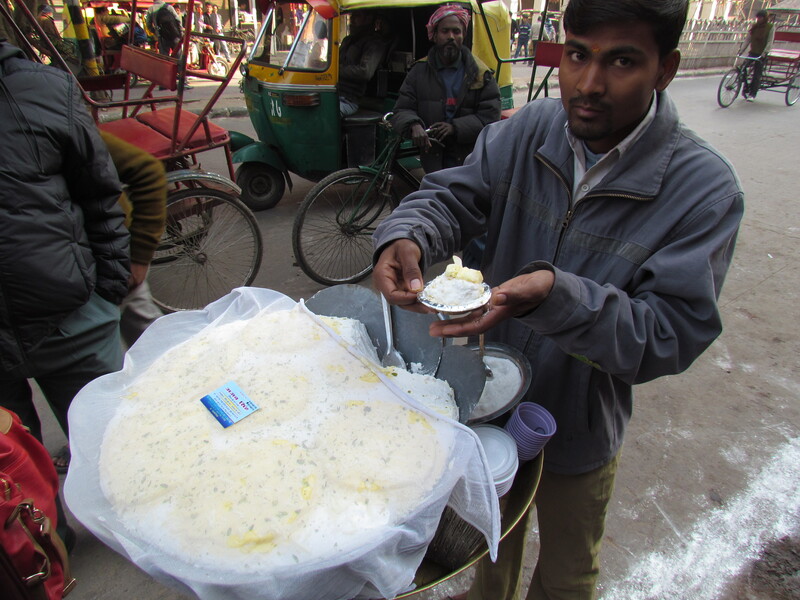 We enjoyed our chaat from Ajab Singh who that day was selling Daulat ki Chaa in front of Parathewali gali. Does anyone know anyone who makes it in Mumbai? Didn’t Vir Sanghvi cover it on TV and call it Malliyo? I missed Vir Sanghvi’s coverage. This one is available only in Delhi winters coz it melts otherwise. Unlikely that it will bsold on streets of Mumbai considering temperature is much warmer in Mumbai. 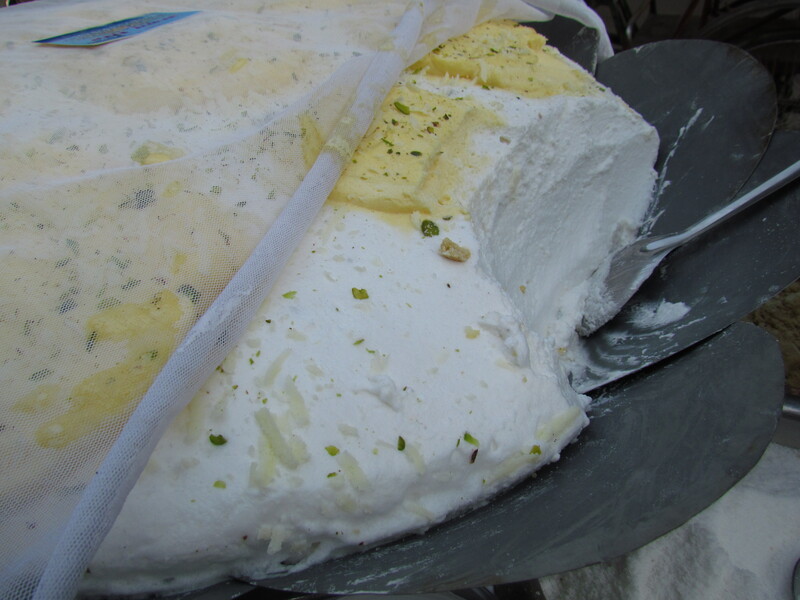 I have had Malhaio in Varanasi but Daulat Ki Chaat seems like a different thing. In Varanasi they whisk saffron flavored milk and serve the foam that gathers on top sprinkled with pistachios in a kulhar. After you finish half of it they fill your pot with the kesar milk. But that think is also available during winters. I had it too. Honestly I bought it thinking of it as khurchan ki mithai. But when tasted it I asked for its name from the vendor. It tastes like the frosting on a cake. Did not like it much though 😦 Not for my taste buds, I will say .